I read We Wish to Inform You That Tomorrow We Will Be Killed with Our Families by Philip Gourevitch when I was still in college. I’m not exactly sure what brought me to the book (certainly not any of my classes), but I do remember reading it and the haunting stories it told. Gourevitch details the atrocities of the 1994 genocide, the lack of intervention from the international communities, and the disgraceful way the European powers did intervene, which ended up mainly helping the génocidaires. The Belgians put the Tutsis in power, serving as the in-between administrator role between the Europeans at the top and the Hutus at the bottom. Of course, this bred resentment and some Hutus attacked small populations of Tutsis. These ongoing divisions and attacks continued after independence and a group of people started advocating for “Hutu Power.” Many people in the group held positions high up in the military and were being trained by the French. Eventually in April 1994, the president’s plane was shot down and Hutus began slaughtering the Tutsis with guns and machetes. Over the course of 3 months, an estimated 100,000 people were killed. Over the last twenty-five years, the country has turned around. When I first got here, I said the country reminded me of Singapore. There are sidewalks everywhere and even some bike lanes. The country is the cleanest I’ve ever been in. It’s completely safe. I can walk around at night alone with no issues. When I get on a moto-taxi, the driver gives me a mandatory helmet to put on. Plastic bags are banned. Paul Kagame, Rwanda’s benevolent dictator since the genocide ended, has revolutionized how business is done. He has prioritized technology, infrastructure, and, perhaps most notably, transparency in government business. This transformation, however, lacks many democratic freedoms and allegations of Kagame’s roles in assassinations of political opponents are rife. I don’t have a lot of photos of Kigali. I suppose I could have attached photos of the clean and beautiful sidewalks. Many of the sights I visited were about the genocide, and for this reason, I didn’t take a lot of photos. I think the most moving part of the Kigali Genocide Memorial is the room that contains all the photos of people who were killed. Black and white photos with young folks sporting beautiful afros and bellbottoms, color photos with straighter hair and young babies, kids on their first bicycles. There are just so, so many people and it’s not even a fraction of the total number that were murdered. At the Murambi Genocide Memorial in the south, they have exhumed mummified bodies on display. This may seem a bit gruesome, but the country is committed to making sure that people remember the genocide and that there will never be people saying that it didn’t happen. 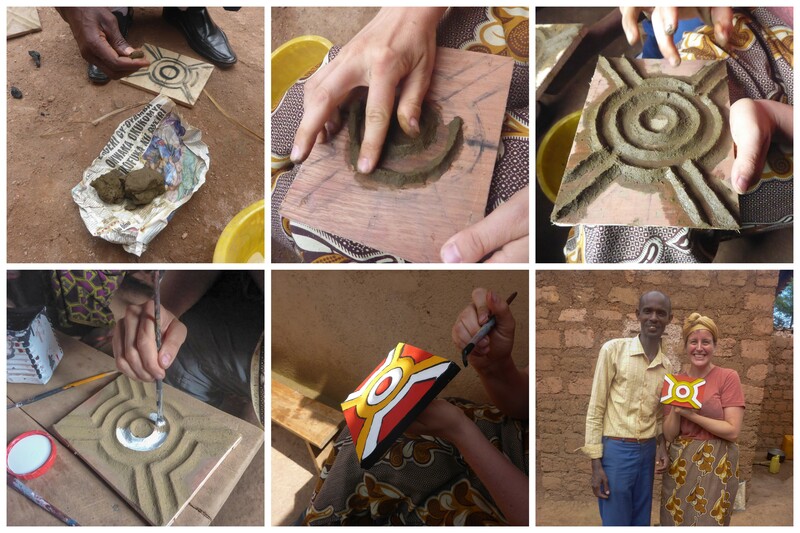 I stopped in this town to have an experience making imigongo, traditional art made from cow dung. 🙂 This almost died out during the genocide, but some people continue to practice it. Mostly it is women, but my teacher learned from his grandmother and really enjoys making his paintings. The process is pretty straightforward. First make a design, then apply cow dung, paint, and smile when complete. I went with Azizi Life and really enjoyed the whole experience, which included hanging out with a women’s cooperative and ended with singing and dancing. Kibuye is just one town on this beautiful lake. I stopped by since I was looking for a relaxing couple of nights. The lake, however, is prone to limnic eruptions because of the high quantity of carbon dioxide and methane found at the bottom of the lake. When an eruption happens, that gas is released and almost all of the living things in the area are killed. Scientists can see this has happened in the past in the archeological record, so although the lake is beautiful, it’s also quite deadly. 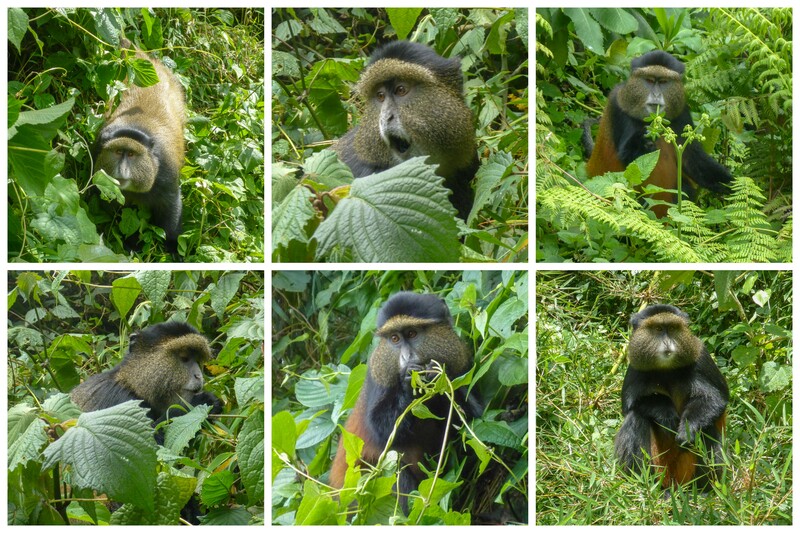 The endangered golden monkeys only live in Uganda, Rwanda, and the Democratic Republic of the Congo. Mostly their habitat has been destroyed and the ongoing conflicts in the DRC haven’t helped their plight. There’s a few thousand of them left, but they still need to be protected. They live in huge crowds and as we were walking through the bamboo forest, we had to be careful to watch out for the golden monkeys scampering around over our heads and potentially peeing on us. they are really cute and friendly and these habituated troops aren’t scared of humans at all. Unlike with gorillas, the women control everything in these troops. I did a terrible job of collecting photos of Rwandan food. Typical food in the village was boiled cassava, cooked bananas, beans, and huge slices of avocado for one big lunch meal a day. I ate beans, rice, and tomato sauce more than once. Rwandans like their Akabanga, a hot chili oil they drizzle with an eyedropper on anything needing some extra spiciness. I drank a lot of African tea (chai!) while I was here, which I love. Fanta also comes in three flavors here: orange, lemon (citron) and fiesta (black current, which is purple colored and definitely my favorite).